Keneesh McKenzie wore an orange and brown patterned head wrap that is now a vision of beauty but once was a sign of servitude. “There was time in the past when black women were mandated to cover their hair in public,” she said. “This was in the southern states of America back in the 1700s and even though it was something meant to oppress them they became resilient and creative from it by using different colors and fabrics and appeared even more beautiful and alluring,” said McKenzie, of Tignon Headwraps. 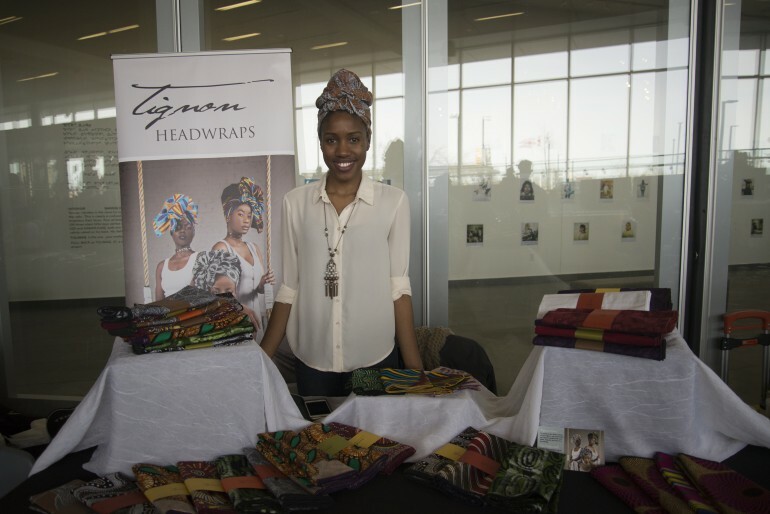 She was one of the many vendors at the marketplace held during the Love Thyself event March 22 hosted by Black Academic Success and Engagement (BASE), at the Learning Resource Commons at Humber’s North campus. 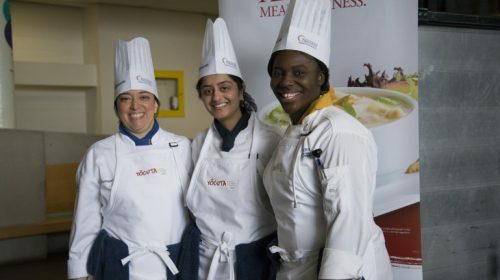 “My brand ties into the fact that women can celebrate themselves and can be creative and resilient and a part of self-care and self-love is putting on something that boosts your confidence,” she said. 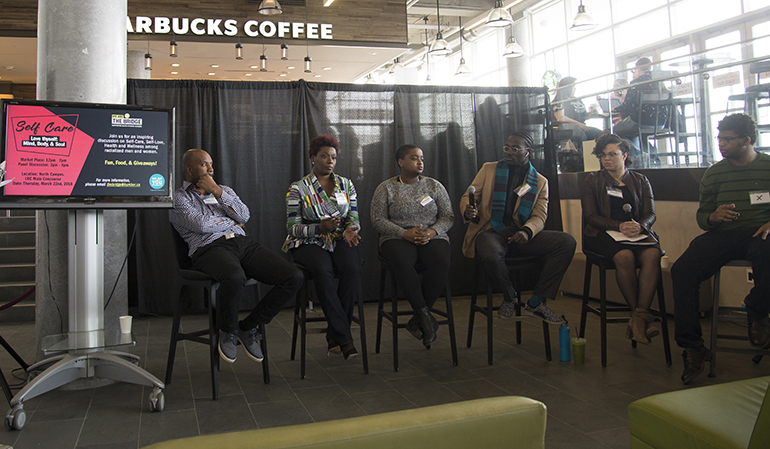 The event also hosted a discussion panel of six successful black Canadians who spoke to students about the importance of taking care of oneself and the issues racialized communities face. “We have panelists from a variety of different industries, some of them identify with having a mental illness and others who identify as diverse or marginalized groups who deal with mental health issues,” said Efe Chehore, a student support advisor with BASE. 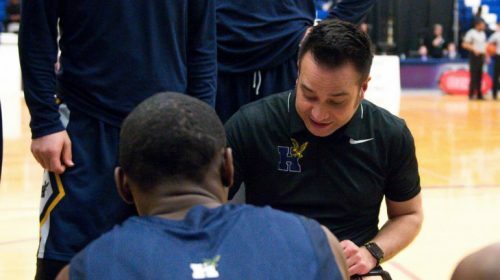 The program aims to help racialized students achieve success throughout their time at Humber. The organization, formerly known as The Bridge, recently rebranded to make their mission statement clearer. 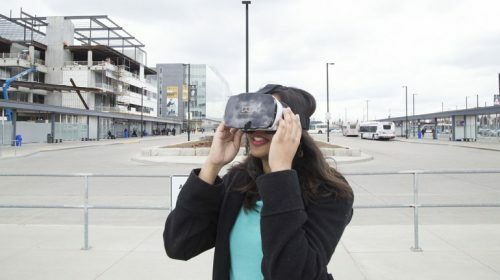 “We are black people in the school community supporting academic success and we want to engage black students in the Humber community,” Chehore said. The panel was one of the many ways they feel that they can help racialized students feel like they have an outlet at Humber, Chehore said. “We wanted to have a diverse group panel to come and talk to students about these issues,” she said. Lawyer Danardo Jones, who was on the panel speaking about mental health and self-care, told students that black communities are in denial when it came to mental illness, stress, and self-care. He cited the myth and stereotype of “toughness” that racialized people seem to be associated with. Jones said mental illness is seen as a taboo in some societies. The history some people in racialized communities have is one that has instilled in their minds that they must be tough, and their feelings aren’t important. “We don’t have time to sit down to think about our mental constitution,” Jones said. He mentioned the many issues that black people face in society from being aware of police to worrying about their children facing racism. “Well If you’re anything like my Jamaican mom then a cup of mint tea is going to solve all of my problems,” Jones quipped. Jones along with others brought up issues that he feels students should discuss and was greeted by applause for being one of the few to say it. at the event. Students had access to local vendors from the black community in the GTA featuring products including hair care, skin care, reading, relaxation and more. Humber’s Spa students performed manicures at the event to raise awareness about self-care. Brands were present at the event to help inspire and motivate black students and learn from their history.